Domaine Marcillet’s 10 hectares of vines are lovingly tended by Nadine and Rémi Marcillet, whose beautiful estate rests on the border of the Côte de Beaune and the Côte de Nuits. 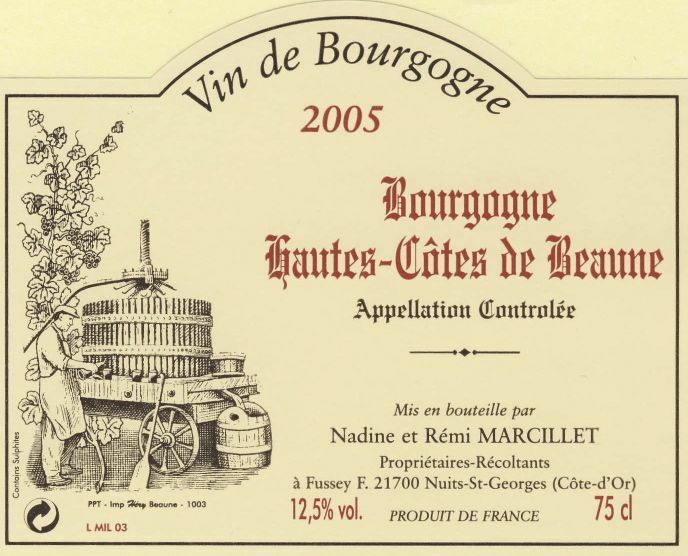 Their vines, which are also tended by the husband and wife duo, lie in the appellations of Hautes-Côtes de Beaune, Hautes-Côtes de Nuits, and Savigny-les Beaune. Sustainable farming, or lutte raisonné, is practiced here: the plants which thrive between each row of vines sustain a microclimate valuable to the fruit’s development, while insecticides, herbicides and fungicides are avoided. Weeding is only practiced at the feet of the vines, and only organic fertilizer is used. Rémi and Nadine began the Domaine about two decades ago, both with a background in wine: Nadine from the Hospices de Beaune and Rémi from the École de Vin in Beaune. The cellars here are remarkably over 200 years old, and inside Nadine and Rémi have mastered their technique: combining both traditional and new methods to make bright, complex, terroir-driven wines.